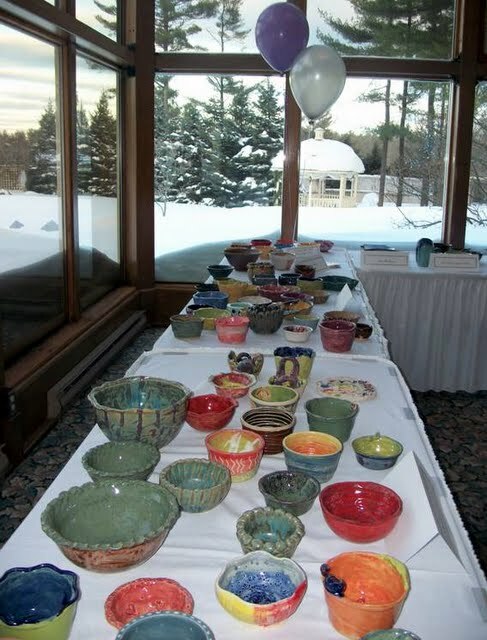 Potters bowl, this year, taking home bowls crafted by Mike Gibbons of Nutfield Pottery. 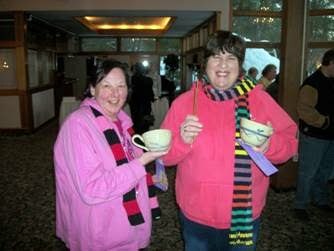 DERRY -- Last Friday night’s annual Community Caregivers Potter’s Bowl lured 200 soup lovers to Promises to Keep, who collectively raised more than $7,000, which will go toward extending vital services to the elderly and disabled. Executive Director Cindee Tanuma couldn’t be happier. She said yesterday the laid-back atmosphere of the fundraising event, which cen­ters around hearty soups, artisan breads, elegant desserts and stimulating conversation, encouraged those who attended to linger over coffee. The hook of the annual event is that beautiful handmade bowls are donated by local potters and school students, which are lined up on a table inside the venue and chosen by patrons, who then fill the bowls with homemade soups, also donated by local restaurants. For the cost of a ticket, attendees walk away with a one-of-a-kind bowl, a full belly, and the knowledge that somehow, through what seems like an awful lot of self-indulgence, they are actually making the world a little brighter for those in need. There was also a silent auction featuring all kinds of gift items, books and giveaways, said Tanuma. And of all the items sold to the highest bidder, perhaps the “coolest” item this year was won by Jim Webb, who will receive a 9by-12 framed portrait of his home, painted by Derry artist Judy Krassowski. “I couldn’t have asked for a better turnout. Once again, the community has come through, and we are truly grateful,” Tanuma said.